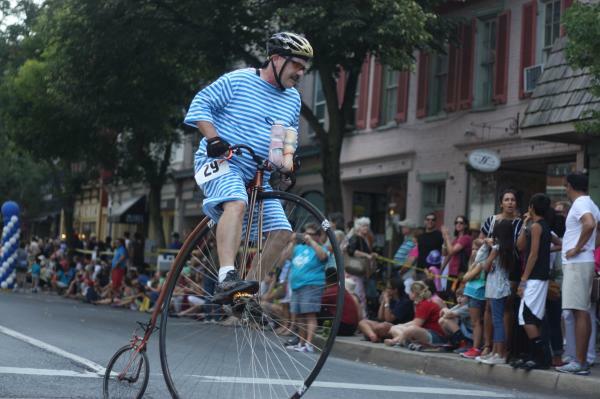 It is no wonder thousands of people swarm to downtown Frederick each August to catch a glimpse of the National Clustered Spires High Wheel Race. 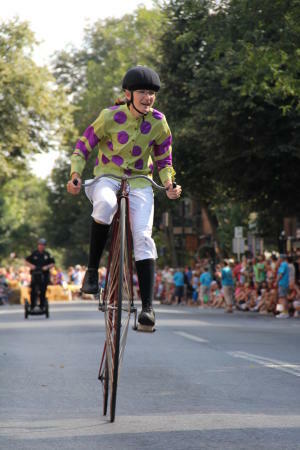 As if seeing racers mounted atop these 4-ft plus tall magnificent bicycles isn’t interesting enough, the racer&apos;s outfits also provide an additional spectacle. If you have been to this too exciting event before, you probably walked away with a memory of some of the unusual outfits worn by the racers. Since the high wheel bicycle - also known as a penny farthing - was popular back in the 1880s, racers wishing to pay tribute to the bicycle’s history will come clad in period-appropriate garb which may consist of a button-up shirt and a pair of knickers or bloomers. These were the garments of choice to prevent entanglements with the cycle cog wheel. Racers proved their commitment to authentic Victorian-era dress if they dared to also wear a jacket or vest in the hot summer heat. Other racers carefully select their outfit to try to grab the attention of spectators, hoping to build their base of fans to cheer them on. Racer Sheryl Kennedy was pleasantly surprised when the bright colored socks she opted to wear became the basis of her cheering section that yelled “Go Socks!” every time she zoomed by them on Market Street. Another competitor, Angie Long, gained the admiration of spectators by donning a pair of high heels each year she raced, claiming the heels simply helped ensure her feet remained on the pedals. Who wouldn’t be impressed by a woman racing a bike in heels? The outfits selected by the racers might be something that interests and inspires them, or simply feels the most comfortable for the event. Over the years the spectrum of clothing paraded during the race has been quite extraordinary - from traditional cycling gear, sport team jerseys, and jockey racing attire to vintage baseball uniforms, retro swimwear and disco-inspired flashy suits. And we can’t forget the handlebar mustaches sported by both the racers and observers which perfectly match the vibe of this event! There is one mandatory dress requirement for the racers… and that is a helmet. Given the safety concerns associated with the design of these antique bicycles (obviously the higher the bike = the bigger the fall), whatever outfit the racers choose, it must be paired with a helmet if they wish to be a part of the race. Given what we have seen from past racers so far, and the amazing display the National Clustered Spires High Wheel Race offers to spectators, the last thing anyone will be looking at are the helmets. If you check out this year’s race, you just might feel like you’ve traveled back in time! 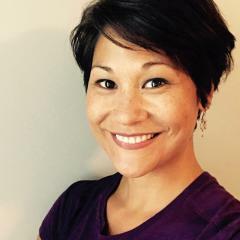 Jeanne Rhodes is a co-founder/organizer of the National Clustered Spires High Wheel Race with her husband Eric Rhodes. 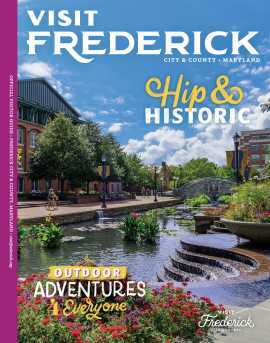 She and her husband are proud to both work and live in Frederick MD with their 2 children.